For 30 years, the National Institute on Deafness and Other Communication Disorders (NIDCD) has supported basic and clinical research and research training on communication disorders. At least 20 percent of U.S. adults have a significant impairment of hearing, balance, taste, smell, voice, speech, or language. For these individuals, the basic components of communication (sensing, interpreting, and responding to their environment) can be challenging. Many factors contribute to hearing loss and balance dysfunction, which can occur at any age and affect communication, safety, and quality of life. The NIDCD’s robust program of basic and clinical research on hearing and balance includes genetics, genomics, and proteomics. This research focuses, in part, on the identification of genes involved in hearing loss to lead to earlier diagnosis and treatment, and to new therapies. Nearly 30 million adults in the United States could benefit from using hearing aids, but only one in four has used them. The NIDCD supports innovative clinical and translational research to lay the foundation for making hearing health care more accessible and affordable. Current research includes identifying barriers to care and assessing novel service delivery and screening models. Researchers are also applying cochlear implant technology to develop other neural prostheses. These devices will, for example, provide a sense of hearing for people whose auditory nerve is removed or damaged; normalize balance by electrically stimulating the vestibular nerve; and help patients with severe speech and physical impairments express themselves using speech synthesized from brain-computer interfaces. Balance disorders can be quite disabling, impairing mobility and often leading to falls. NIDCD-supported scientists are examining how the brain interprets information from the ear’s vestibular organ. This positional information helps us understand where our bodies are situated in three-dimensional space, allowing us to move with ease. NIDCD clinical researchers are also developing rehabilitation procedures and prosthetic devices to improve the quality of life for individuals with balance disorders. NIDCD-supported research helps us understand how our senses of taste and smell relate to our health and well-being and allow us to interact with our environment. NIDCD-funded scientists study many aspects of taste and smell, from how we first detect odors and tastes through sensory cells in the nose and taste buds to how the brain regions involved in the central processing of incoming taste and smell information function. Scientists are also working to better understand how taste and smell sensory cells are regenerated or replaced across the lifespan by underlying stem cells. These studies may someday help scientists develop ways to restore the loss of chemosensory function due to chemotherapy, aging, injury, or disease. 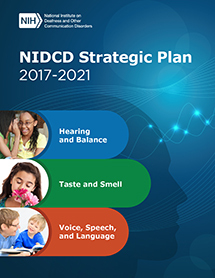 The NIDCD also encourages clinical research to improve the diagnosis, prevention, and treatment of taste and smell disorders in all age groups. More clinical and epidemiological studies will help us better understand how factors such as nutrition, early dietary experiences, individual genetic variation, aging, infection, and disease affect chemosensory sensitivities and taste and smell disorders. NIDCD research is leading to improved identification and treatment of voice, speech, and language disorders such as spasmodic dysphonia, stuttering, and specific language impairment. In addition, scientists continue to identify genes responsible for persistent stuttering, which tends to run in families. Other ongoing research is focused on ways to improve communication in children with autism spectrum disorder (ASD), including the 25 to 30 percent of children with ASD who remain functionally non-verbal beyond age five. The NIDCD has long supported the NIH Autism Centers of Excellence Program, which funds large research projects, some of which focus on developing effective interventions to help children with ASD better communicate. NIDCD-supported research also addresses voice, speech, and language impairments linked to injury, stroke, and neurodegenerative disorders such as Parkinson’s disease and amyotrophic lateral sclerosis (ALS). These communication problems—such as aphasia, dysarthria, and apraxia—often lead to increased isolation and poor quality of life. As we head toward new frontiers in scientific discovery and precision medicine, the NIDCD is well-positioned to support innovative studies to produce more sensitive, effective, and individually tailored interventions. NIDCD-supported researchers are dedicated to expanding our understanding of hearing, balance, taste, smell, voice, speech, and language and improving rehabilitation strategies for children and adults who face the challenges of communication disorders. Judith A. Cooper, Ph.D., is acting director of the National Institute on Deafness and Other Communication Disorders (NIDCD) and director of the NIDCD Division of Scientific Programs. Dr. Cooper has advanced the mission of the NIDCD since the institute was established in 1988. She holds an undergraduate degree from Southern Methodist University in Dallas, an M.S. in speech-language pathology from Vanderbilt University, and a doctorate in speech and hearing sciences from the University of Washington in Seattle.